"Gave Apple Music a try. Made a few nice playlists. But the interface was driving me mad, so I'm back to Spotify (with open arms?). Is there an easy way to import my recent playlists into Spotify playlists？ Googling this seems to be just ideas on how to do the opposite. Maybe Spotify should have an easy import tool to go along with a "Come back to me" ad campaign?!?" 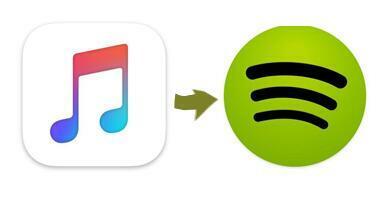 This can be explained you the methods of moving your playlist with Spotify. You know that both of them are totally different streaming services with different accounts. There is no way that you can sync or copy them between both of them. You can follow the next step-by-step guide to finish the copy process. Step 1. Login your Apple ID, and here you can free download the music files offline. Step 2. Free Download Macsome iTunes Converter, install and run it on your Mac. 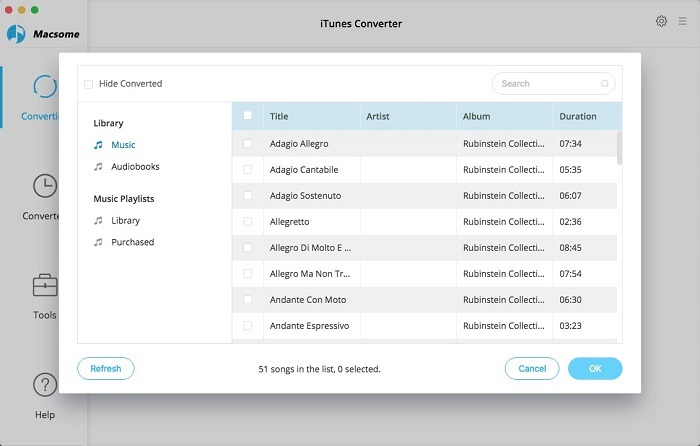 Macsome iTunes Converter supports converting any Audio tracks including songs, albums, purchased Audio books and so on to MP3, AAC, FLAC and so on. Even the audio files are protected and limited with DRM, if you can play them on iTunes normally, you can convert them with its help. 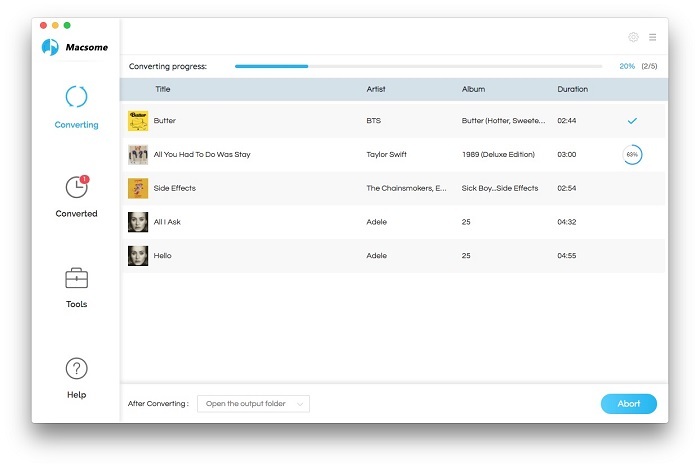 Upto 20X conversion speed convert kinds of protected audio files with ID tags and all metadata. Not only Mac version, the iTunes Converter also supports a Windows version for Windows users. Step 3. 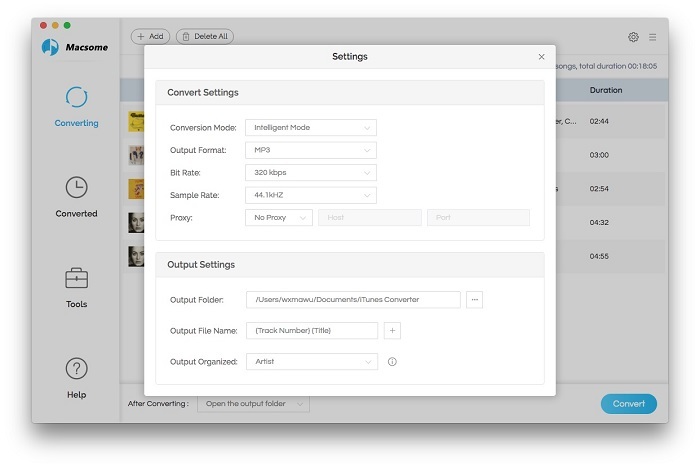 On the user interface, click "Add", and then import the downloaded files from the library of iTunes. Step 4. Click the setting icon, and set the output audio format and the output path. Step 5. Click "CONVERT" and start conversion. Step 6. Drag and drop the converted files to Spotify. Now you can play the primary Apple Music playlist on Spotify as you like. Apple Music is an online streaming service by Apple. Users select music, and select stream on their device on demand. The service includes the curated Internet radio station Beats 1 and the blog platform Connect for artists to share media with fans. Apple Music provides music recommendations based on user taste and is integrated with Siri voice commands. Spotify is a Swedish commercial music streaming, podcast, and video service that provides digital rights management-protected content from record labels and media companies. It is available in most of the Americas, Western Europe, and Oceania. Music can be browsed or searched by artist, album, genre, playlist, or record label.